It’s the fall of 1899 and the new Mrs. David Bradley—formerly Professor Concordia Wells of Hartford Women’s College—is chafing against the hum-drum routine of domestic life. The routine is disrupted soon enough when the long-hated but wealthy patriarch of her husband’s family, Isaiah Symond, returns to Hartford. His belated wedding gift is a rare catalogue by artist/poet William Blake, to be exhibited in the college’s antiquities gallery. When Symond’s body is discovered in the gallery with his head bashed in and the catalogue gone, suspicion quickly turns from a hypothetical thief to the inheritors of Symond’s millions—Concordia’s own in-laws. She’s convinced of their innocence, but the alternatives are equally distressing. The gallery curator whom she’s known for years? The school’s beloved handyman? Once again, unseemly fate propels Concordia into sleuthing, but she should know by now that unearthing bitter grudges and long-protected secrets to expose a murderer may land her in a fight for her life. 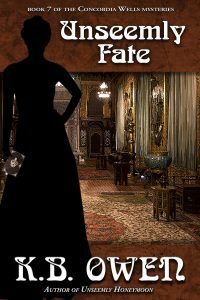 UNSEEMLY FATE is the seventh adventure in the CONCORDIA WELLS MYSTERIES, featuring 1890s professor-turned-amateur-sleuth Concordia Wells Bradley. Available for PRE-ORDER…to be released May 1st! Don’t miss any of K.B.’s new releases! Sign up today, and receive a FREE novelette! Thanks for signing up! Your email is in good hands, I promise. Once you have confirmed your subscription you’ll receive a thank you email with a link to my FREE novelette, NEVER SLEEP!